Remember this 1770s gunstock frame from Ira, Vermont? I have written about this historic timber frame a few times – from this blog, when I first started working with the farmer to help him find a client over 2 years ago, to when I announced the news in February that a new owner had been found, and that restoration could move forward. With a seasoned Green Mountain Timber Frames crew, we worked on the barn starting in February and re-erected the frame in July. 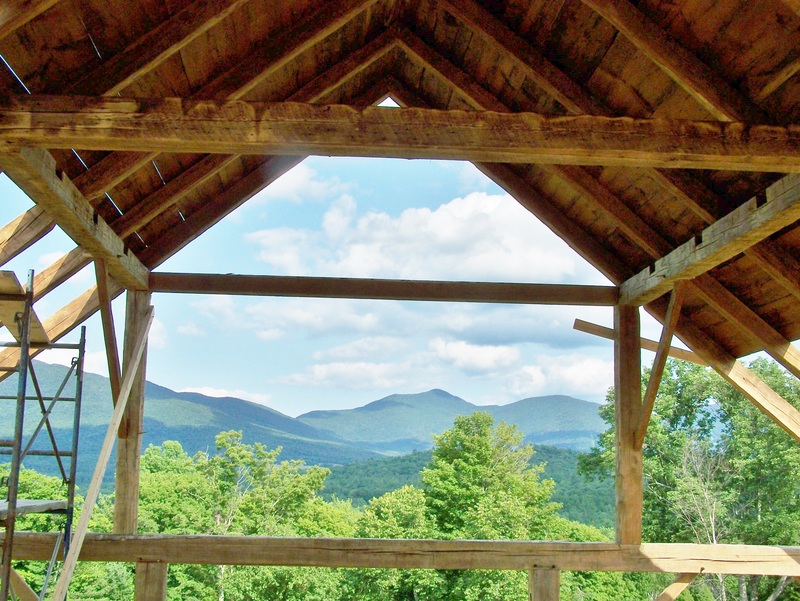 One view from the restored barn is Mt. Mansfield, below. 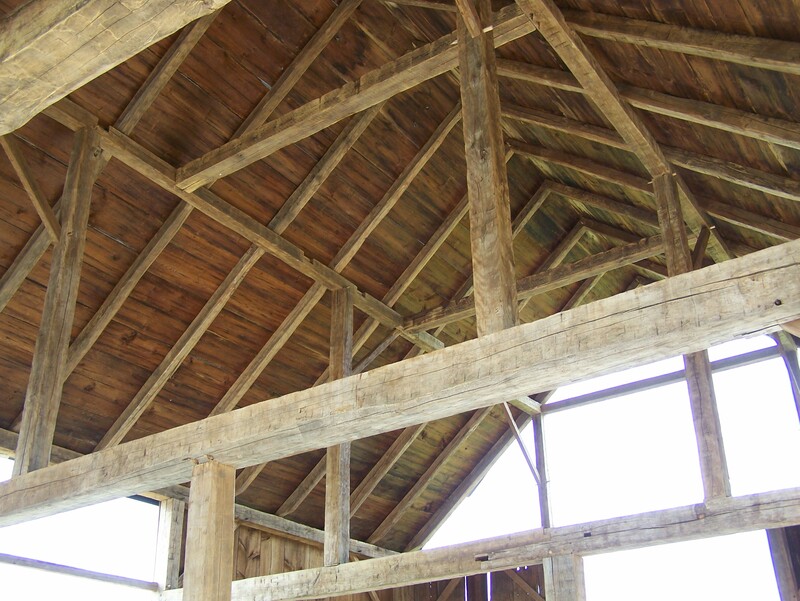 To show the restoration work that we did on this rugged antique barn, I have some before and after pictures prepared. Below we see the structure, before and after. What was once a ragged, crooked barn, is now a cleaned up frame, straight and dignified for the new owners. Next you can see the process of disassembling the frame in Ira, and then carefully reassembling it up in Northern Vermont. Below, we see the frame from the gable end. 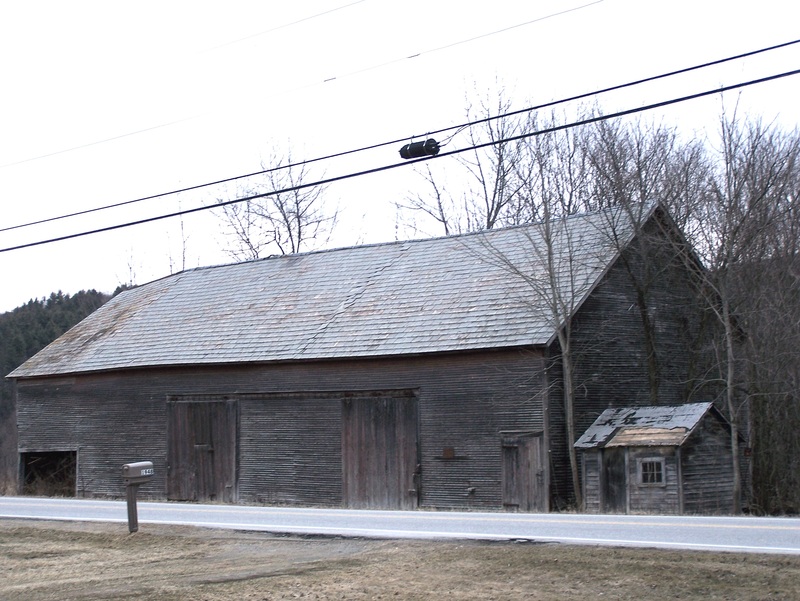 As you may recall, the oldest section of this barn was erected in 1770, and an addition was built in 1870. These pictures show the view looking through the part of the frame that was added in 1870. Next, notice the wall boards as seen from inside the frame, taken before and after the restoration process. We spent a good deal of time cleaning the roof boards. (I wrote about the process of cleaning the roof boards in an earlier blog post.) The pictures below show the roof boards cleaned up. Notice the deep, rich color that only 240 years of Vermont weathering can create. With the restoration complete, the frame is ready to serve the new owner as an equipment storage barn. The beams now cleaned and re-erected, straight and sturdy, this timber frame can last for many generations. Interested in a historic timber frame home? Have an old barn for sale? Please contact us! This entry was posted in Barn Raising, Green Mountain Timber Frames, Post and Beam, Sold Timber Frame Homes, Timber Frame Projects and tagged American heritage, barn frames, barn houses, barn raising, barn restoration, barn style homes, Green Mountain Timber Frames, gunstock timber frame, historic barn, old barns, old barns vermont, timber frame, timber frame barn, vermont timber frames, vermont timberframe, vermont timberframes by Green Mountain Timber Frames. Bookmark the permalink.